As 2019 approaches, the digital marketing landscape that includes SEO, social media, PPC, content marketing and more is witnessing a dramatic shift. There may have been a time when you could’ve dismissed artificial intelligence or visual search as just the new kid on the block, but that time is long gone. 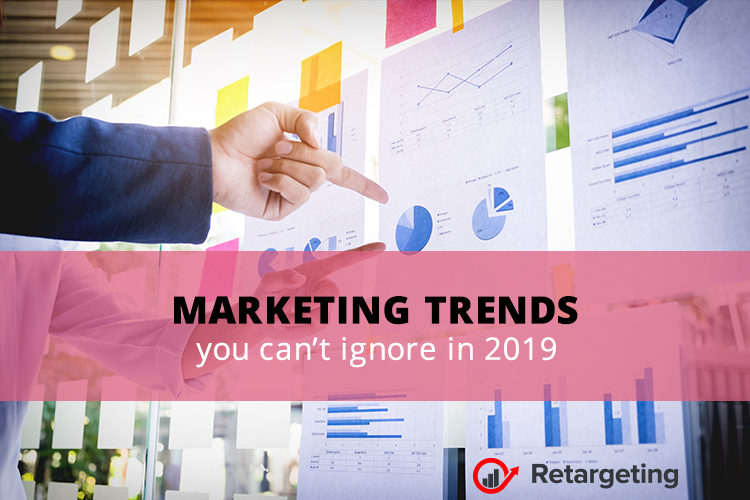 There are many new marketing trends and strategies that are evolving in the current high-tech, Internet-connected era and businesses should use them to succeed in their efforts because what worked for you last year may not work this year. So here are the key digital marketing trends for 2019! AI can analyze consumer behavior and search patterns, utilizing data from social media platforms and blog posts to help businesses understand how users and customers find their products and services. Programmatic advertising means using the before mentioned AI to automate ad buying so you can target more specific audiences. This automation is much more efficient and fast, which means higher conversions and lower customer acquisition costs. It’s changing the face of digital advertising so fast that, according to specialists, almost 90% of digital display ads in the U.S. alone will be programmatic by 2020. If you want to stand out in 2019, you need to personalize your marketing and that means personalized content, products, emails, and more. The future of email is real-time, behavior-based personalization. A recent study shows that personalized, triggered emails based on behavior are 3x better than manual emails. – 52% of consumers say that watching product videos makes them more confident in online purchase decisions. These numbers show the importance of incorporating video into your digital marketing strategy in 2019. These statistics show the growing popularity of social messaging apps for business purposes. They can be very useful in sending messages to customers directly, as they allow personalization and add value to the users’ experience. This differs from the messenger chatbots we discussed above. You’re actually able to market to customers using messaging apps now! With visual search, users can upload an image to conduct a search and get more specific results, taking the experience to a totally new level. Instead of typing queries into a search engine, you can directly search through images to find similar images, price comparisons, local shopping results, etc. People spend an average of 3 hours and 35 minutes on their smartphones every day, and by 2019, mobile devices will be the medium that gets the most minutes. This is changing the way brands must work to capture buyers’ attention. Micro-Moments is a “new consumer behavior,” as termed by Google, that delivers your marketing message clearly and concisely in a way that is of interest to the consumers, all within a span of seconds, otherwise, you lose their attention. To take advantage of micro-moments in 2019, be where consumers search for information in the moment, such as Google, Google Maps, Amazon, YouTube, and anywhere else people search for information at a moment’s notice. Since stories disappear after a set period of time, this is a great opportunity for marketers to make good use of FOMO. You can feature your team in the Stories, behind the making of a product, ask for reviews about your products and services. 2019 will be about better customer experience with the help of personalization, automation, and AI-powered technologies. To stay ahead of the competition and increase conversions in the upcoming year, you’ll need to get better at producing custom, conversational content to share with your better-targeted audience.